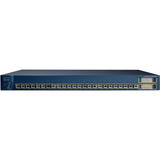 The Cisco Catalyst® 3550 24 FX is a member of the Catalyst 3550 Series Intelligent Ethernet Switches, a line of enterprise-class, stackable, multilayer switches that provide high availability, security and quality of service (QoS) to enhance the operation of the network. With a range of Fast Ethernet and Gigabit Ethernet configurations, the Catalyst 3550 Series can serve as both a powerful access layer switch for medium enterprise wiring closets, as a backbone switch for mid-sized networks, and also for the edge of metro access networks. For the first time, customers can deploy network-wide intelligent services, such as advanced quality of service (QoS), rate-limiting, Cisco security access control lists, multicast management, and high-performance IP routing--while maintaining the simplicity of traditional LAN switching.